We're rather fond of pirates in our house. Occasionally we even dress up like them -- it's a good costume for a daddy/daughter halloween duo! 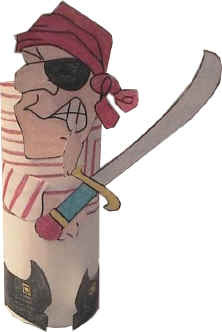 The pirate is a cute and simple color, cut and paste craft that uses a toilet paper roll as a base to give it a three dimensional effect. Color (if using the black and white version of the craft) and cut out the template pieces. I like to make the rectangle look like a red striped shirt with white pants. Glue the boots to the bottom of the toilet paper roll (we did it so it looked like the pirate was sitting down).